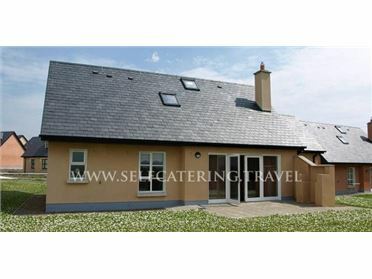 Shraigh Beach is a wonderful single-storey, detached cottage situated a minute walk from a sandy beach, seven miles from the town of Belmullet, County Mayo. This cottage sleeps four people in two bedrooms with en-suites, consisting of a super king-size double and a double, plus there is a separate bathroom. The cottage also has a kitchen with dining area and a sitting room with dining area, bar and multi-fuel stove. Outside there is ample off road parking and lawned gardens with a patio and furniture. Shraigh Beach is a quality base for watersports, coastal walks, Ballycroy National Park and Archill Island. The coastal town of Belmullet is situated between Blacksod and Broadhaven Bays in County Mayo and offers shops, pubs and seafood restaurants. This area boasts fishing and watersports, as well as coastal walks.